A snapshot may be captured of the entire schedule or from the user’s selection. Click File > Take Snapshot > Of Entire Schedule (as printed) from the menu bar. The Screenshot Settings window opens. To save to your computer, choose File next to Save To. Otherwise, leave as Clipboard. Browse for the desired location, enter a filename, and click Open. When finished, click OK. If clipboard was chosen, you may now paste the image in the desired application. Click File > Take Snapshot > From Selection (as printed) from the menu bar. The cursor will change from the Select Tool to the crosshairs . Left-click with the mouse on the canvas and without letting go, drag the cursor around the desired area. Release the mouse. 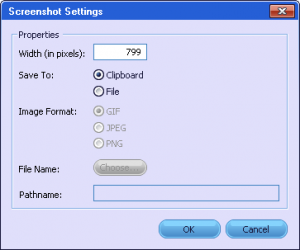 The Screenshot Settings window will open. Tip: A screen shot may also be taken from selection by pressing the CTRL key while using the Select Tool . NOTE: When capturing a snapshot from selection, the captured image won’t necessarily include everything as its displayed. This is because the snapshot corresponds with how the canvas is printed, not how it’s rendered on-screen. For example, if the schedule has been scrolled to a particular section of the network and a snapshot is taken from selection, the calendar strips won’t actually show up, because their location when printed is at the top of the canvas. The same applies for the holiday line and the resource profile. Additionally, elements like dialog windows (e.g. the Resource Key) cannot be captured, as they only display on-screen. Width (in pixels) Displays the size of the screenshot to be captured. By default, the size will match the size of the canvas. It may be scaled, however, by adjusting the width (the height will adjust proportionally). Save To The destination of the screenshot. Images saved to the clipboard for pasting are only temporary. Image Format The format of the image. File Name For naming and choosing the destination. Pathname Displays the destination chosen above.